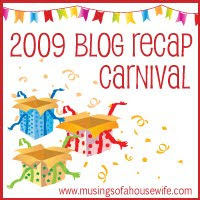 As the sun starts to set on 2009, I decided I must follow along in the fabulous (and stylishly clad) footsteps of Jo-Lynne and join her fun 2009 bloggy recap carnival. The idea is genius in its simplicity, just copy the first line from the first post of each month this past year. Can you guess what I did this morning? I realize now that could be seen as rather vague, but there was a picture following that teaser. Oops...now this sounds slightly sleazy. I promise it wasn't. And no, I'm not doing it again this New Year's Day, although I wish I was. Again, not sleazy. Saturday I hosted a little Stampin' Up shindig and thought I'd share the makes and takes with you too. Yawn! I think I just fell asleep reading that builder beige sentence. You too? Sorry. But, there were several cute homemade card samples and a party on the trampoline. So I was sitting at home Monday morning doing something terribly productive while Annelise was at school. Like watching a DVRd Oprah, ruminating on adoption and the size of our family. There wasn't really a first sentence per se, so I copied the title instead. This post documents my return to Weight Watchers last year. It was so brief and unproductive I hardly posted about it again. Sigh. I got a letter the other day asking me to come back. Mail that makes me bitter is no fun. Especially when I know it's right. Sigh. As we head out of town. That sentence makes a bit more sense when you have the title as context. My girlfriends and I took a road trip to a tiny Texas town for a fabulous weekend of friendship, spiritual growth and let's not forget, bird nests. One afternoon last week I was struck with the urge to create something and at the same time spruce up our foyer windows. Again, that sentence has a lot more zing after reading Oops...I Glued it Again as the title. 2009 was the year I embraced my glue gun and mistreated a few of our windows. Fun times with fabric, fringe and hot glue. Look! An actual running themed post (since I am Marathon Bird after all). Complete with a run-on sentence and a hyperbole. The sad thing is, I'll have to adjust my intervals all over again once I get myself together and actually, you know, go for a run. After reigniting my scrapbooking flame recently, I am pleased as punch to report that I finished the Maine vacation album. Wait! Don't all click over at once, we don't want to crash the system. After finishing that vacation album my scrapbooking flame dwindled. I hate that I am either an all or nothing type of person. I'll give you one guess as to what it might be. September dawned and something went missing...my sweet daughter lost her first tooth. Thankfully, no more are loose so I can continue deceiving myself that she's not growing up so fast that it makes my head spin. In an effort to deal with the shoe boxes full of photos, newspaper clippings, cards and ephemera, saved by my grandparents and parents, I made a decision. Here is where I had the brilliant idea of posting old photos every Friday and calling them Friday Flashbacks. However, I think I only did this two, maybe three times. Are you noticing a pattern of me not quite following through with my big plans? Yeah, me too. Is there anything sadder than a jack-o-lantern the morning after Halloween? Your typical Halloween recap post. Instead of dressing up like Laura Ingalls, Annelise decided she had to be Princess Amidala from Star Wars this year. Maybe 2010 will be her prairie year. Thanks to Annie at Basic Joy, I discovered this year in review challenge. I started Gwen Bell's Best of '09 Blog Challenge and made it all the way to Day 18 before fizzling out. Is it a good thing that I am consistent in my incomplete-ed-ness (my word, feel free to borrow)? Probably not. Whew! That was quite a trip down bloggy memory lane, wasn't it? 2009 was not in any way a bad year, but it was not a great year either. Looking back I see lots of starts and stops, a handful of changes and plenty of stagnant areas too. I'm looking foward to a clean slate, a fresh start thanks to the gift of a new year dawning in just a few short hours. A fresh start sounds good to me, too! Happy New Year! Thanks for the trip down memory lane. It's fun looking through all those old posts, isn't it? I will borrow your word uncomplete-ed-ness, thanks. I think it suits me too. Happy New Year! You're consistently inconsistent! Love it! Let's be friends, 'cause I am, too. Happy New Year! I'm gonna buckle down and be a runner again--let's revive together. Loves to one of my FAVORITE blog-friends. Cute idea..I am going to do it too! Heh. I like July's best. :-) Happy New Year! Making money on the internet is easy in the undercover world of [URL=http://www.www.blackhatmoneymaker.com]blackhat guide[/URL], You are far from alone if you haven’t heard of it before. Blackhat marketing uses not-so-popular or not-so-known methods to generate an income online. hi i am a newb here i do allot of [URL=http://www.mydjspace.net]dj download[/URL] in my free time. I will be able to help on this message board and should stay around!